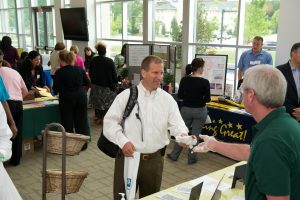 A company health fair is a great way to introduce and encourage on-going healthy habits for your employees. Creating an event that is educational, well-attended, and supports long-term health management can be achieved by following some of the ideas we will mention below. Start planning your health fair at least five months in advance. A planning team can be assembled for the event to assist with the tasks. This may be the human resources department, or it can be representatives from various areas within the company. Health Fairs are better attended when different department managers are involved in the planning, as they are more apt to promote and encourage their staff to participate. It is critical for leadership to support the health fair and encourage employees to participate. Having memos sent out from staff members reminding the employees about the event is imperative for participation. It is also great to have C level staff members at the health fair mingling with both the vendors and the employees. Of course, you do not want to go through all the hard work of organizing an event only to have little to no attendance. The success of your event depends on your employee participation and follow-through. Give incentives to employees that participate by providing food, giveaways and door prizes. Make sure you announce your event well to your employees. Post flyers up around your building, send emails with reminders and provide incentives for your emplooyees to attend. Many vendors will provide screenings, massage and other services that will attract your employees. Theming your event is a great way to encourage attendance and will make your event more fun. Below are some popular themes to choose from. When determining the best time of year to host your event, consider company peak periods and facility needs during these times. Timing your health fair during slow times can increase morale and participation; therefore it may be wise to consider a quiet period. If space is an issue, you may also want to consider a warmer season so you could have the option of hosting your event outside. 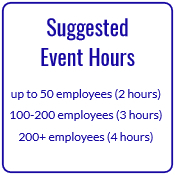 Schedule the event around the time that you feel your employees would be most available to visit the event to increase the chance of high attendance. To attract qualified vendors to display in your health fair, it is not recommended to hold your event for longer than 5 hours, nor is it suggested to have your health fair start before 9 AM and end after 5 PM. The below is a good outline for the length of your health fair. Health fairs are also a great time to introduce your employees to long-term health programs that are scheduled within the company. Long-term initiatives can include employee paid programs such as weight loss programs, smoking cessation programs, chair massage services, stress management classes, walking programs, etc. IAB’s providers offer a wide range of workshops to schedule throughout the year. If your company has multiple sites, you may need to plan your events on separate days so you can have vendors and benefit providers attend all events. In the circumstances that your locations are spread out, different vendors will be needed for each area. Keep each event’s details separate as it will be easy to mix up as you begin the process. 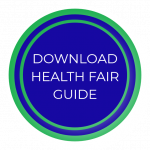 If the other sites are too small to support a health fair, request additional materials from your vendors to make available to the employees at the other locations. 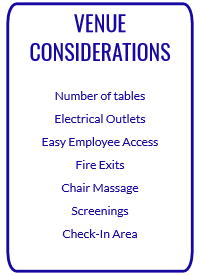 When selecting your venue, you will need to consider space and electrical access. It is also necessary to take into account what size tables you have for the vendors to display their information (6ft or greater is suggested) and how many will fit comfortably in this space. 1-foot or greater is suggested between tables, and a minimum of 3-feet walking space for your employees with all fire exits clear. You may want to take into account that your vendors will need extra floor space and electric as they may provide screenings and video displays. When considering Chair Massage, Vision, Spinal screenings along with flu shots and biometrics, remember that each of these will require space for both the vendor’s display and the employees. Many vendors use tall stand-up displays that will block traffic and event visuals. Request that all vendors place their banners behind their booth and with this in mind, give the vendor 3ft behind their booth for their supplies, chairs, and movement. 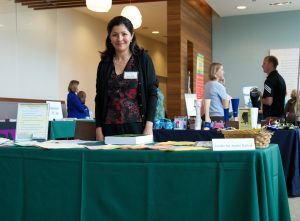 The vendors you invite to your Health Fair will be the cornerstone of your event. When selecting the educational topics and vendors that you consider appropriate for your health fair, you may want to consult with your insurance broker to get a utilization report lending information to the top health risk of your employees. Keep your event educational and fun by including information that employees would not usually have the opportunity to understand like Acupuncture, Water Filtration, Reiki and, most importantly, Mental Health. All Providers should be sent an invitation to participate in your event 60 – 90 days before the event date. 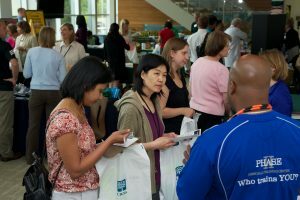 The vendors you invite to your Health Fair will be the cornerstone of your event. When selecting the educational topics and vendors that you consider appropriate for your health fair, you may want to consult with your insurance broker to get a utilization report lending information to the top health risk of your employees. Keep your event educational and fun by including information that employees would not usually have the opportunity to understand like Acupuncture, Water Filtration, Reiki and, most importantly, Mental Health. All Providers should be sent an invitation to participate in your event 60 – 90 days prior to event date. Give vendors a way to RSVP providing their booth needs so you may accommodate within your floor plan. Some vendors will provide screenings, chair massage or need space for stand-up displays. keep all information in a spreadsheet for easy event set-up on event day. It is important to remember that your benefits providers are your employee health partners. A health fair is an excellent way for your employees to interact with their insurance providers to learn more about their benefits and health resources available to them through their plan. Decide what insurance providers you would like to have at your health fair and what information and giveaways you would like to have them bring. 30 days prior to the event it is suggested to send a “Save the Date” out to your employees so they can put the event on their calendar. This can be emailed and posted throughout your facility near high traffic areas to ensure maximum exposure to the information. Offer suggestion boxes in various places for employees to suggest creative ideas or vendors. A survey or hints to win prizes at the event can also be contained in this posting. 2 Weeks prior to the event it is suggested to send an Event Announcement to employees giving full details about the event. Include the date and time of the event, attending vendors and any attendance promotions you may have. Once all attending vendor’s booth requirements are finalized, you can begin ordering items needed for your event. 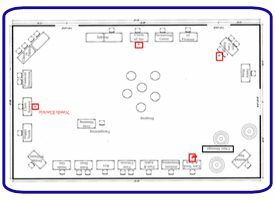 Design a floor plan placing each vendor in the room based on the vendor’s booth needs along with your room & table size. Make sure you have accounted for a check-in table and with a familiar staff member to greet each employee. Try to keep all vendors in one room. If screening rooms are used, there should be a check-in table or proper signage direct the traffic. This will help with the flow of employees and allows you to keep an eye on how the event is going. When placing vendor’s tables, try to keep similar vendors separate. As tempting as it is to put them together, it does cause friction and a competitive nature among vendors, which could make it unpleasant for everyone. Make sure the venue is set-up and ready to go for the vendors the day before if you have an early event. Have a minimum of two staff members to assist with the event at all times. Make sure you have the room ready for vendors 1 hour prior to the event start time. This will give you and your vendors plenty of time to get in and safely set up prior to your employee’s arrival. Some vendors will arrive early and some will be late. This is to be expected and considered on event day, so please keep this in mind. l want to make small talk with you as you are trying to greet and accommodate other arriving vendors. Let them know you will be around during or after the event to speak with them in more detail. Use your spreadsheet to check in vendors as they arrive and hand in their raffle prize. Have two staff members at the check-in table to greet the employees as they arrive. It is highly suggested that a C-Level staff member also be present at your event to show employees their endorsement. Staff members can rotate between checking in employees and checking on the vendors. As employees enter, hand them their event guide and give them their raffle instructions. After employees have visited each booth, have them come back to the check-in table to join the raffle. As vendors begin to pack up and leave, take the time to thank each one for their time at your event. You may want them to come back again. If they feel their time was well spent and appreciated, they will be happy to accommodate any future events and individual presentations you may need. Pull from the raffle entries and announce the winners publicly the day after the event. 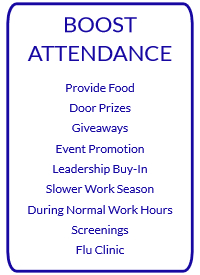 This is a great reminder to the employees how much you appreciated their attendance and reignites the excitement. Send a survey out to all employees asking them what they thought of the event. Provide them with an opportunity to make suggestions for next year’s event.